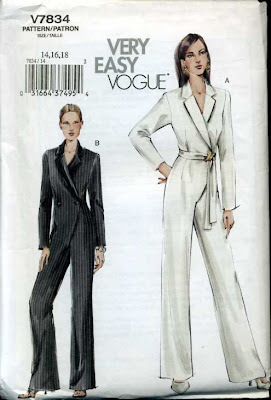 Assorted Notions: Jumpsuit, emphasis on "suit"
Alright, who is going to pounce on this 2003 Vogue at Lanetz Living so you can copy this Stella McCartney jumpsuit from the Spring 2009 RTW collection? I can't pull this off but I'm sure there is some tall lanky reader out there who can! What a great find! I'm not the lanky kind myself, but that still rocks. My very lanky BFF could definitely wear this jumpsuit and she loves Stella M.
Not me, I would look like a stuffed sausage. BTW, I found your instructions yesterday on the twisted neckline on BWOF tshirt from last year to be most helpful. I amrecycling a shirt for my daughter and for some splash, I used that for the binding. May be finished later today with pics. The jumpsuit is a little too much for me, but I am impressed with your pattern finding skilz! No, not for me. The Stella McCartney one looks like a diaper from the back, though. I think the Vogue would actually be a much better choice! Hi Christina, and thank you for you comment on my coat, I found this very ...how to say it : "bizzare" suit on your blog, not for my type of bodyline :)interesting though. Nope, can't do it. Jumpsuits, no matter how pretty, make me shudder. I had two copies of this pattern and I just gave one away. Mmmm, me thinks I'll give it shot. Stay tuned. hey hey! When I first saw the image I wondered if that was your ongoing project and was quite relieved to see it was not ;o) I don't really know what to think about it but my first reaction is hell no! There is someone out there that would look great in it..not me! Good find Christina...tall I am, but no longer lanky...I think I'll pass on the jumpsuit. Besides I have lived through that era and it's no fun to have to almost totally undress to go to the bathroom! Good catch. So, not my style. Great find, but alas I am far from being tall and lanky. goes to show it's worth keeping some of our old patterns though, if not for making then for selling! I don't quite like the Stella M one, pants are too short and unfitted around the waist. The Vogue ones look much nicer! Especially the black one. Sometimes you got to know what looks good on you. Wish this did, but sadly not for me. This is so cute until the first time you need to go to the loo (bathroom) - didn't work in the eighties - don't need to reapeat that mistake now! Just imagine what that would like when the model sits down, all that fabric in the crotch area? Not attractive at all. In fact, I think the pattern (done in the 80s/90s) looks much better than Stella's interpretation. I've always been fond of jumpsuits and I see they'll be a strong trend this spring! What a great find! I just remenber that I have this pattern in my stash: thanks to give me some idea.